In today's first reading, an incredible thing takes place. The inhabitants of Nineveh respond to Jonah's warning of doom and gloom resulting in the fact that they repent in sackcloth and ashes.What is astounding to me is not the message of the prophet, but the response of the king, who calls his people to change their ways and turn back to God. Even the king fasts and does mortification, publicly, stating that maybe the Lord God would change His Mind about destruction. God "relents", which merely means that from all time He knew that the Ninevites would repent and become good people. Now, at Akita, Our Blessed Lady told us that a horrible time of trial and tribulation was imminent. I printed her words a few weeks ago. "As I told you, if men do not repent and better themselves, the Father will inflict a terrible punishment on all humanity. It will be a punishment greater than the deluge, such as one will never have seen before. Fire will fall from the sky and will wipe out a great part of humanity, the good as well as the bad, sparing neither priests nor faithful. The survivors will find themselves so desolate that they will envy the dead. The only arms which will remain for you will be the Rosary and the Sign left by My Son. Each day recite the prayers of the Rosary. With the Rosary, pray for the Pope, the bishops and priests... The work of the devil will infiltrate even into the Church in such a way that one will see cardinals opposing cardinals, bishops against bishops. The priests who venerate me will be scorned and opposed by their confreres; churches and altars will be sacked; the Church will be full of those who accept compromises and the demon will press many priests and consecrated souls to leave the service of the Lord...The demon will be especially implacable against souls consecrated to God. The thought of the loss of so many souls is the cause of my sadness. If sins increase in number and gravity, there will be no longer pardon for them." The trouble is that no one heeded Mary, who is greater than Jonah. No leader of the Church has called for days of fasting and prayer against all the evils, or has called a rosary crusade. The importance of leaders declaring fasting and mortification, prayers and penance can be seen in the unity of the nation repenting, each person, one after another, to form a new people, a humbled people. Jonah succeeded where Mary has not--because of our own free wills. We all, and especially the leaders in the Church and in governments, have snubbed Mary. When the tribulation begins, we shall be sorry, indeed, that our leaders were not as obedient and humble as the king of Nineveh. 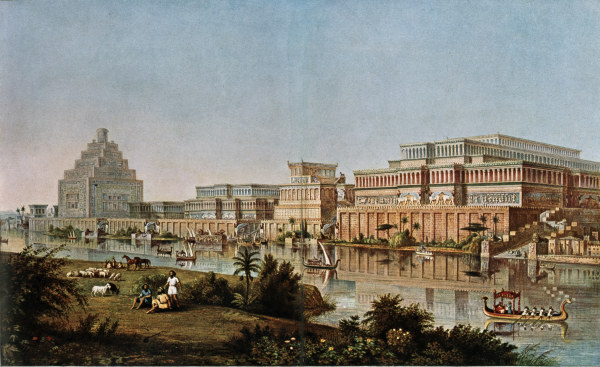 By the way, Nineveh was in what is now Syria or Iraq, depending on the map. Rhoslyn is busy spreading the word about the upcoming Youth Conference in Southport (6-8 March) where another excellent line-up of speakers will help to form the next generation of pro-life activists. The talks given at that conference will be published on this blog over the coming weeks. Below are the next two presentations from last year’s youth conference, held in Telford. The videos show Fiorella Nash’s talk ‘Men and Abortion’ and the closing address, delivered by SPUC’s Director, John Smeaton. At a time when Feminism has become intimately connected with support for abortion on demand, pro-life feminists, such as Fiorella Nash, are few and far between. Fiorella’s talks are always popular at the youth conference, perhaps because the youth of today crave arguments which incorporate an emphasis on the equality (and complimentarity) of the sexes with an equal emphasis on the sanctity of motherhood and children. John Smeaton, SPUC's chief executive, gave a rousing talk to close another excellent conference, imbuing attendees with a sense of the urgency of the situation, whilst inspiring them to continue with their endeavours to protect human life from conception to natural death. I am not sure if it because two wars were fought on European soil in the last century, or whether it is because the normal European lifestyle is simpler, (less food, less space, more community), but I am increasingly aware of the fact that in opposition to Europeans, many Americans live in Fantasy-land. Fantasy-land has been made out of the bubble of consumerism. Consumerism dulls the mind and soul, making the pursuit of things more important than the pursuit of the interior life. One of the reasons why Adoration and contemplative lifestyles are so important to set up in America would be to combat consumerism. 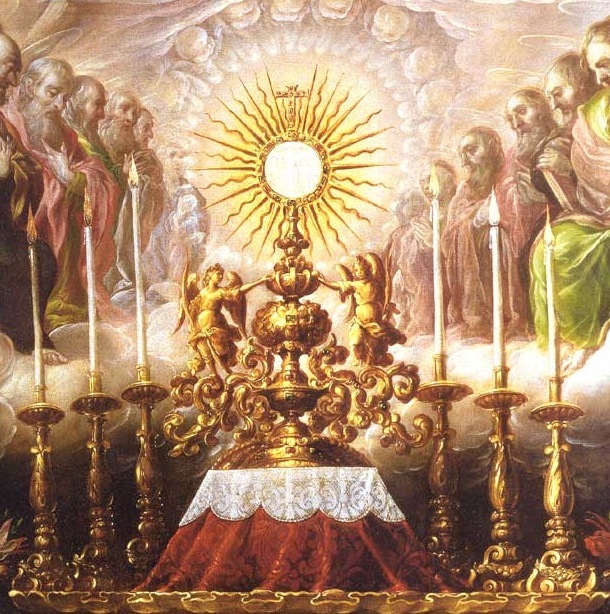 I pray for this to happen...the simplicity of the Eucharist in the Monstrance, the Vulnerable God, combating, silently, Fantasy-land. Consumerism causes a person to fall into the philosophy of materialism, which only holds that matter, what what sees, touches, hears, tastes and so on, is real. Ultimately, materialism denies the soul and the spiritual life. Fantasy-land is my name for Augustine's City of Man, the city which grows up and thrives alongside the City of God, which is largely, though not exclusively, unseen. St. Augustine is very clear about those inhabitants of the City of Man who are "dead". In Book Thirteen of his masterpiece, he expertly and neatly outlines the distinction between those who are alive in their souls, and those who are dead. He states, "For the wicked have life in the body, but none of soul." Their lives are lived out in death and when they die, they shall experience the second death. Fantasy-land is a state of living death. Those who chose to live for things, consumed by things, working for things, have chosen their gods of the earth, the gods of Fantasy-land. Some souls are dead because these people have never been baptized. Their souls are still in the darkness of Original Sin, a fact many Catholics forget. Baptism regenerates the soul, giving the person life in Christ and making that person a son or daughter of God and heir of heaven. But, one can lose sacramental grace given in baptism through mortal sin. Those in Fantasy-land live as though they will live on earth forever, not facing God in judgment, both particular and final. The problem here in America which defines the inhabitants of Fantasy-land, is that these people encourage each other to continue to live in this false paradise. If you recall the Genesis story, God throws Adam and Eve out of paradise so that they do not eat of the Tree of Life and live forever in evil. 22 And he said: Behold Adam is become as one of us, knowing good and evil: now, therefore, lest perhaps he put forth his hand, and take also of the tree of life, and eat, and live for ever.23 And the Lord God sent him out of the paradise of pleasure, to till the earth from which he was taken. Americans in Fantasy-land want to live forever, creating environments of such a level of comfort that they can forget about death, something which must be remembered daily. 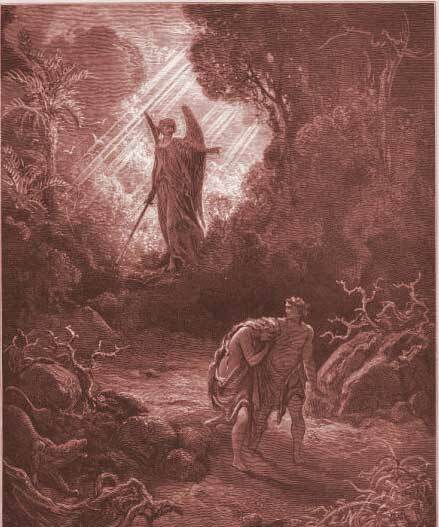 The expulsion from Eden has been forgotten. If Adam and Eve would have been allowed to stay in Eden, it would have become a permanent Fantasy-land. How does one remember being kicked out of paradise? There are two ways: through the acceptance of suffering and through mortification. One must tear one's self away from Fantasy-land and move into the City of God. Departing from the City of Man means exactly that--becoming different than those around you, being that sign of contradiction in the world which each Catholic should be by the fact of their baptismal grace. We are not in Eden, and we should not be creating Eden on earth, but the City of God. St. Augustine in the same chapter notes that bodies of the saints rest in hope of the resurrection of the body to life in God. Augustine writes that those who hated their bodies on earth, in other words chose penance, will love their bodies in heaven. Can one imagine the hatred one will have for one's own body and soul in hell? St. Augustine makes an analogy between the tree of the knowledge of good and evil and the "free election of the will". Now, after Original Sin, we must choose daily against evil and for good. This is a daily trial, the same one presented to Adam and Eve. We must choose against the false Eden of Fantasy-land, and God. For an American, this choice proves to be extremely difficult. One is surrounded by those who are choosing to build up the false city over the true one. How hard it is for the majority of Catholics to choose against this false Eden. For some of us, to whom suffering poverty and real want has been allowed, it is actually easier to stand outside the City of Man and walk towards the City of God, as one is denied the means to join those in Fantasy-land. One can choose poverty and one can endure it. Enduring is not enough. One must choose within the set boundaries made by God, choose Divine Providence over the accumulation of things even in one's mind and desires. Poverty can actually be a gift, allowing one to focus not on the things of this earth, which one does not have, but on God. Penury is not the same as poverty. Penury is extreme poverty, the type of life I live. The advantages are that God has decided on mortification for one, rather than me choosing such freely. To be in midst of Fantasy-land and choose mortification would be a higher call, a higher grace, than what I have. Obviously, God knows how weak I am and allows me to have, to own, nothing so that I must turn to Him daily for my basic needs. He understands how easily I would lose my soul in Fantasy-land, so He keeps me outside the gates of the City of Man. For this, I am grateful, even though I never know where I shall live or how I shall eat regularly. Anxiety changes into desire for God alone under these circumstances. But, I did choose long ago never to compromise truth for lies, or comfort for truth, and my state in life reflects the consequences of not compromising. Would that all Catholics would choose not to compromise, as then we would see a holy, vibrant City of God. I wrote about Dickens' characters in Martin Chuzzlewit just two weeks ago or so, mostly all of these "people" rushing after riches and comfort, some even living in deceit, lying about their evil, choosing money and things over virtue. Dickens' work shows that the creation of Fantasy-land is not the invention of Americans, but of man and satan from all times, since the Fall. 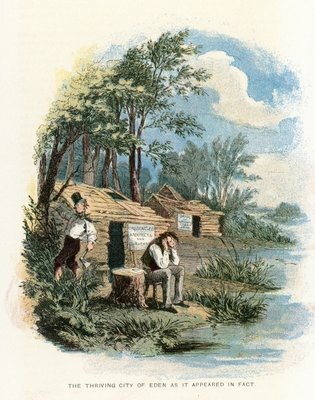 The themes of Dickens' book are deceit, pharisee-ism, and greed. The truly evil characters choose fraud and even murder in order to maintain wealth and status. One sin leads to the next and the next. One forgets one's dependence on God alone, and builds a false paradise on earth, rooted in corruption. Little decisions, not big ones, like murder or fraud, can lead one into the false Eden, into Fantasy-land. I know people who chose physical comfort in second marriages without annulments, and in jobs which cause them to daily deny Christ. Now, that they are gone from this earth, I think of choices they can no longer make. Perhaps they do as well, as remorse comes in purgatory, and stays in hell.